Too often doctors can't see how to create a direct response ad that works right away without looking unprofessional, so they resort to ads like this. Good thing the Daily Inter Lake was there to help. This one's about an urgent care facility--you know, those places you can go for treatment of the flu or minor fractures if you don't want to wait for hours in a hospital emergency room--and how it went from feeling print had failed them in this recession to becoming a born-again convert to our client's newspaper, the Daily Inter Lake in Kalispell, MT. No doubt you have a similar prospect in your market. With Walmart about to open a similar service (do they have their hands in everything or what?) across the street and an area hospital running their own urgent care facilities throughout the area, they clearly needed help with their ad strategy and Joel Brann at the Daily Inter Lake expertly used our Response Oriented Selling techniques to help turn them around (and into a major advertiser). As mentioned in my previous post, the Daily Inter Lake's 17 ad reps (plus associated designers, managers, and business community members) recently completed our course and sold every presentation (we got them started by helping them create and practice a presentation before setting them loose). As you can see, their first try was a pretty typical medical ad. Many businesses like this, where the people are the product, believe they're stuck in an all or nothing scenario--either run like a retailer with a 50% off sale or simply put little more than their name, picture, and logo in the ad. 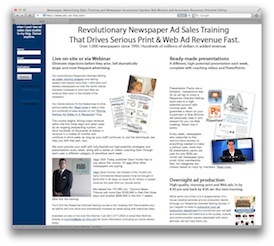 The trick here, especially in this economy, is not only having a solid method to coming up with a reliable ad strategy, but being able to change the way the prospect views print and Web ads, including why a major jump in size and frequency was needed to succeed. The new ad got the right target customers seeing, reading, and responding. Exactly what they needed to compete with Walmart and the area hospital. First, the strategy. As always, the key to a more effective ad wasn't discussing what they're good at, but recognizing and addressing why people in need of an urgent care facility actually do choose one place over another. In this case, the reasons are pretty obvious, but of course, it would be best for the ad (and the outcome of the sale) if it came from the account. So once we determined that, the ad came together very quickly. The picture grabbed the attention of those in need of these services, the benefit was simply what the prospects cared about, and the balance of the ad gave enough evidence that even the most skeptical prospect (who was all set to go to their competitors') would believe it and respond each week. Now on to the bigger issue of getting the prospective advertiser running a dramatically larger ad--a 6.7" x 14" ad--after the failure of (what they considered) a perfectly good strategy, and how to get them running at a higher frequency, too, in this case twice per week. Anyone reading this who has taken our Response Oriented Selling course knows exactly how to prove this strategy will work the very first time and consistently afterward, as well as how to convince the advertiser to run it week after week, so go get 'em (and let us know if we can help)! For the rest of you, the trick is to change the underlying incorrect theories that lead an advertiser to run like this, and do it long before the prospect is staring at the huge spec ad at the end of the presentation, when their resistance is typically at a maximum. In fact, teaching this "Response Model" at the beginning of the first sales call lowers resistance and immediately and firmly establishes the ad rep in the "partner mode", ensuring smooth sailing from the outset. Since it uses the Socratic method of teaching, buy-in is always there. Once this is accomplished, any objections that arise when the ad is presented, be it about size, frequency, or content, are then just traced back to the part of the Response Model the advertiser agreed with during the first meeting. No pushing, no pressure. In effect, you do the only thing the advertiser is hoping for in the first place, which is to prove to them they'll get a response. If you or your own staff isn't using this approach, chances are you're leaving a ton of money on the table and, even more importantly, are hurting your advertisers and your newspaper (and not doing your career any favors, either). Why not give us a call at (631) 647-0445 and we can tell you more about this approach and perhaps even show you a few of them in a Web meeting? You've got nothing to lose and hundreds of thousands of dollars to gain.